The covenant is the heart of an Ars Magica saga. It protects what's dear, supplies what's crucial, and hides what must remain secret, even through the ages. And each one changes over time, from the poverty and enthusiasm of Spring, through the glory of Summer, to the stability and power of Autumn, ending with the decline of Winter...or not, as many covenants renew their youth, flowering into Spring once more. 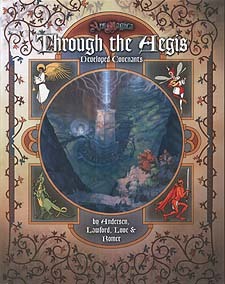 Through the Aegis provides five fully detailed covenants for your Ars Magica saga. There's one for each season, each set in a different Tribunal. Each includes fully detailed magi, regional and local maps, and fully stocked libraries. Use them as bases for player character magi, as antagonists in your stories, or as inspiration for your own exceptional creations!